If you’re fluent in English and another language, and would love to help with the Neatline project, please consider contributing a translation for our Neatline plugins! 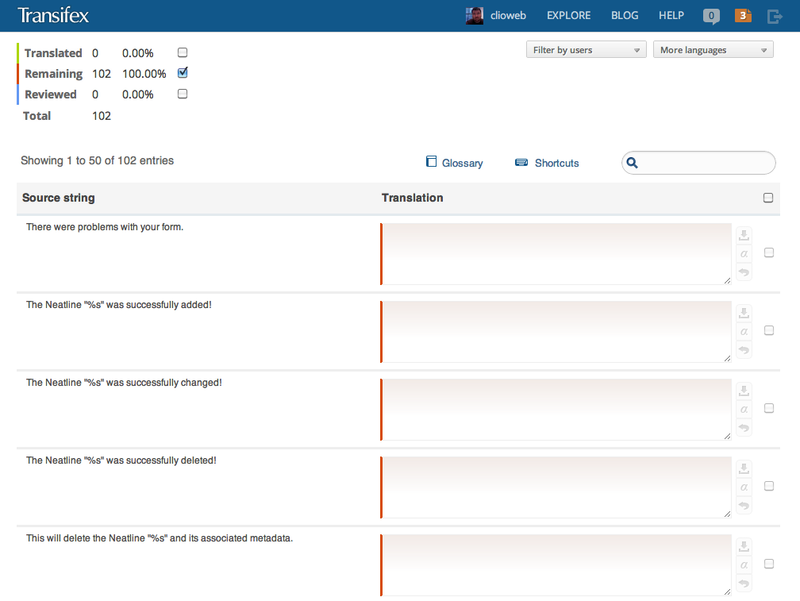 We’re using a service called Transifex to manage translation work. To get started, just sign up for a free account on Transifex (or log in using your Twitter or Facebook account), then check out our Neatline project page. If you already see a language listed, just click on it, then request to join that language team to begin contributing. If the language you’d like to contribute doesn’t appear on the list, just click the link near the top of the languages list to “Request a new team” and we’ll add that team to the list, and add you to it. Once all that is set up, you can begin adding translations to any (or all!) of our plugins. Once you’re added to a language team, you can click on that language, and see a list of the resources (i.e., Neatline plugins) we have available to translate. Clicking on any of the resources should bring up a modal window with various options for translating the resource, including a button to “Translate Online”. From there, you’ll be presented with a page that has the English word or phrase on one side, and a text area to contribute a translation on the other. The Omeka team also manages their translations through Transifex, and they have some nice documentation on contributing translations using the platform; if you have questions, try checking their page. Additionally, Transifex also has some nice documentation for many features of their service, including contributing translations. As translations are completed, we’ll add them to each plugin’s languages directory before each release. So if you’d like to see Neatline in a different language, please consider contributing a translation. We appreciate your help in giving Neatline a truly global reach! Cite this post: Jeremy Boggs. “Translating Neatline”. Published July 31, 2012. https://scholarslab.lib.virginia.edu/blog/translating-neatline/. Accessed on .